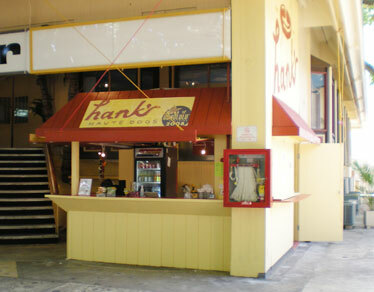 Isle restaurateur Hank's Haute Dogs has opened a second location -- they are now located at the International Market Place, 2330 Kalakaua Ave. Hank's is offering two new items only in Waikiki: a Hawaiian dog served with sweet condiments; and Hank's potato chips. The new store is open from 11 a.m. to 9:30 p.m. daily. Hank's first opened in Kakaako in 2007. Hoku Solar, a subsidiary of Kapolei-based Hoku Scientific Inc., said yesterday it has completed the installation of a 254-kilowatt photovoltaic power system at the Oahu warehouse and distribution headquarters of Paradise Beverages Inc. The system uses more than 1,540 modules to produce an estimated 525,000 kilowatt-hours of solar power annually. It is the third of three solar projects totaling 358 kw of power that Paradise Beverages has implemented. Bioponic Phytoceuticals Inc., a Maui-based natural medicine company, said yesterday it has signed a marketing agreement with Truly Natural Marketing, a New Hampshire-based sales and marketing firm specializing in all-natural products. Truly Natural will market Bioponic's product lines as part of its national product roll-out. Hawaii ranks 40th out of U.S. states that are the most vulnerable to spikes in oil prices, according to a report released yesterday by the nonprofit environmental organization Natural Resources Defense Council. The average Hawaii driver spent 4.58 percent of their annual income on gas last year, amounting to $1,798.14 per driver. Mississippi ranked first, with residents spending 7.87 percent of their income on gas. States were ranked on how heavily drivers were affected by increases in oil prices. Hawaii ranked 32nd for its efforts to reduce oil dependence, including state vehicle efficiency and state-sponsored grants for research and development. The state ranked 38th for its prioritization of mass transit spending. Waimea Valley has joined the Koolau Mountains Watershed Partnership. The partnership is a voluntary alliance of public and private landowners who help manage forested watershed areas of the Koolau mountains to ensure fresh water supplies. According to a statement released yesterday, 101,000 acres are signed into the partnership. About 91 percent of the Koolau range summit landowners are part of the partnership. NEW YORK » JetBlue Airways Corp. plans to reduce seating by as much as 9 percent in the fourth quarter and cut an unspecified number of jobs to counter record fuel prices after the discount carrier posted a $7 million quarterly loss. The airline also is deferring delivery of 10 Embraer E190 regional jets and agreed on a $110 million line of credit with Citigroup Global Markets Inc. JetBlue will stop flying to Ontario, Calif., on Sept. 3. The carrier plans to pare jobs "commensurate" with capacity reductions through attrition and voluntary buyouts, Chief Executive Officer Dave Barger said on a conference call. PHOENIX » US Airways Group Inc. said yesterday it swung to a huge second quarter loss as it struggled to deal with spiking fuel costs. Chairman and CEO Doug Parker said his airline will further reduce seating capacity this year in hopes of boosting sales, and he expects to raise up to a half billion dollars annually in new travel fees. The rest of the industry is doing much of the same, Parker noted, and he said that might be enough to make the airline industry profitable again in 2009. For the three months ended June 30, US Airways lost $567 million, or $6.16 per share, compared with profit of $263 million, or $2.77 per share, for the same period last year. Revenue rose 3 percent to $3.26 billion. DETROIT » Ford Motor Co. plans to revamp some U.S. plants and bring six small vehicles to the U.S. market from overseas to meet customers' growing demand for more fuel-efficient options, a person briefed on the company's plans said yesterday. Ford has no immediate plans to close U.S. plants despite overcapacity in a slumping market, the person said. Instead, the automaker will retool plants to increase production of smaller cars and engines. Ford isn't confirming details until tomorrow, when it releases second-quarter earnings. * Micah E. Young as business operations manager. His restaurant experience includes RUI Corp., Shanghai Bistro and the BIstro at Century Center. * Isaiah Christopher Delsi as restaurant manager. His 15 years of experience include Transpacific Acquisitions and Restaurants Unlimited. * Alexio Thomas Corleon as executive chef. His 15 years of experience include Kapono's in Aloha Tower Marketplace and Jackie's Kitchen. * Kunani S. Blake as general manager. His 20 years of experience include Harley Davidson Cafe in Las Vegas and Hard Rock Cafe in Honolulu, Maui, San Diego and Las Vegas. * Julia Matsuura as a client services specialist in the brokerage services division. Her previous experience includes marketing and sales. * Mark Egan as a real estate manager in the asset services division. He was previously a property manager at Torrey Pines Property Management in San Diego. * Michelle McCain as real estate services coordinator in the asset services division. Her work experience includes seven years of technology sales. » The National Association of Insurance and Financial Advisors Hawaii has honored Chinen & Arinaga Financial Group founding partner and senior vice president Martin Arinaga as the NAIFA Insurance and Financial Professional of the Year. » The Investment Management Consultants Association has honored Bank of Hawaii trust officer Kevin I. Higa with the Certified Investment Management Analyst designation. » The Hawaii Restaurant Association has inducted L & L Hawaiian Barbecue/ L & L Drive-Inn founder Eddie Flores Jr. into its 2008 HRA Hall of Fame.